How's everybody doing today? I hope your week has been treating you well so far. Today I've decided to participate in a tag I learned about through the Female Geek Bloggers G+ group known as The Geeky Girl Tag! I learned about it from The Howling Wolfheart, and this tag was originally created by Zombie Goddess Beauty. 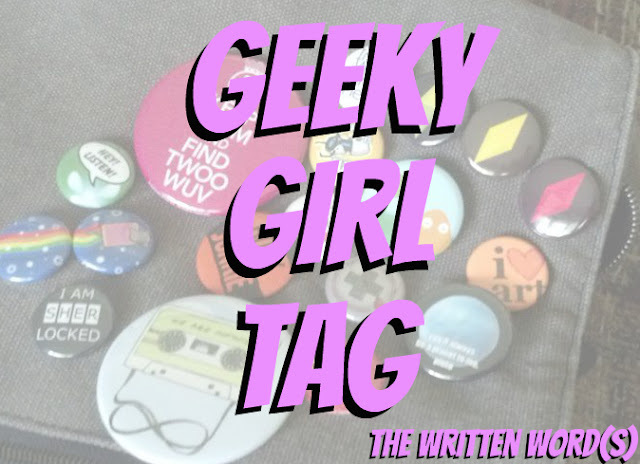 Go check out their posts, as well as their respective blogs, which are both awesome :) Anywho, time for me to answer some geeky girl questions! Hufflepuff, through and through! I'll be honest, when I was first sorted by Pottermore, I was hoping to be sorted into Ravenclaw, but since then I've embraced yellow and black, and I am a very proud Hufflepuff. #3: Who is your favorite Doctor? I'd have to go with #11! I'll be honest, I haven't watched very much Doctor Who - barely any, to be completely honest. But I have seen more episodes with the Matt Smith as the Doctor, and I have developed a particular fondness for him. This question is so freaking hard, there are too many options! I mean, lots of characters from novels and manga come to mind, just so I could meet them in person: Tohru Honda from Fruits Basket, America and Maxon Schreave from The Selection series, Stargirl from Love, Stargirl. #6: If you had a super power, what would it be? #7: What is your favorite fantasy world? The very first thing that popped into my head when I read this question was the world created by Mary Pope Osborne in her children's book series The Magic Tree House. From what I remember this tree house appears out of nowhere, and there are a ton of books inside about different times and places in history. Open up a book, and you can go there! That way I wouldn't have to limit myself to just one fantasy location! Star Wars, 100%! I never grew up with Star Trek as a part of my life, and I may have seen a single episode from one of the series, but Star Wars is something I've gotten into over the past few years, from my boyfriend showing me the original trilogy, to seeing The Force Awakens in theaters, to now being addicted to the collectible card game Star Wars: Destiny. #11: List your top 5 favorite video games. Urbz: Sims in the City. 8. If you could be any fictional race, what would it be?